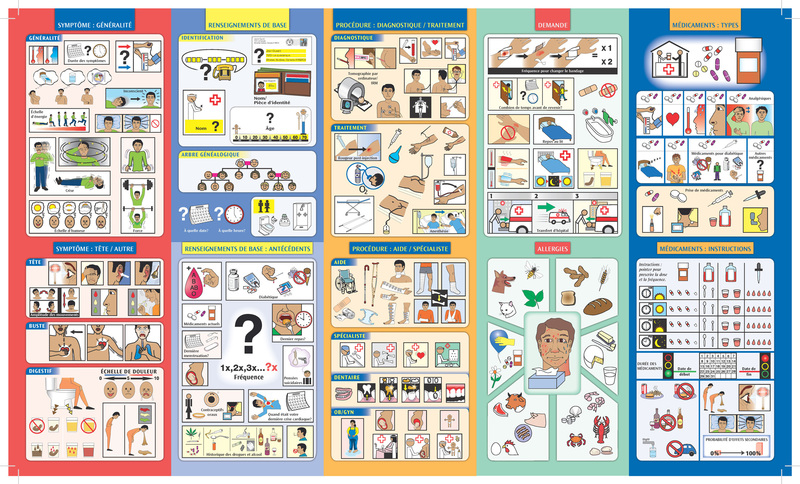 Our Medical Visual Language Translator translated into French. The same great tool with essential content for dealing with and treating medical needs and emergencies. Printed on waterproof synthetic paper. The Medical VLT facilitates fast communication between medical personnel and patients and contains essential content for dealing with and treating medical needs and emergencies. Helps exchange information with patients about symptoms and conditions including falls, bites, wounds, allergic reactions, toxic ingestions, critical pain and illness identification, as well as medication dosage and treatment options. The new 24-panel version gives you four more panels of content, with additional food identification graphics and Language Identification panel to assist in finding an interpreter when necessary.